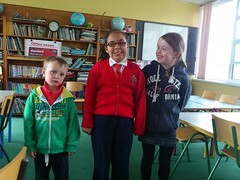 Photo shows some of the young voices at #ictedu. I HAVE A SHORT workshop during the annual ICT in Education Conference in Thurles on 11 May and am sharing one of their audio clips on my blog post. Its short link is bit.ly/busybeevoices. The annual Schools Conference in Thurles showcases excellent workshops by some of Ireland's most enthusiastic teachers, starting with a CESI Meet the night before the main event. There's a full day worth of high energy activities in store. It's one of the most valuable forms of professional development anyone involved in education can find on the Irish calendar. Big props should go to Pamela O'Brien for pulling together this year's event. You can follow the flow on Twitter by using the #ictedu hashtag and listen in to some of the voices through Audioboo's educasting channel. Bernie Goldbach teaches creative multimedia on the Clonmel campus of the Limerick School of Art and Design. One of LSAD's outreach activities helps local students find their voices.